Pixar movies are the best (everyone knows that, right? ), and are are on pretty heavy rotation at our house. Characters from Pixar movies are beloved, and obvious choices when it comes to kid costumes. 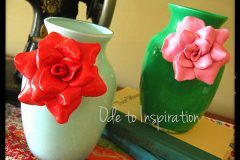 I’ve seen so many handmade Pixar costumes this week in my e-sojourning, so I’m writing a post this week highlighting some of the best. Check out my previous posts in the series: 25 Best Geeky Handmade Costumes, 9 Kids’ Food Costumes, 7 Handmade Lego Minifig Costumes. Such a cute costume for a pair of kiddos! 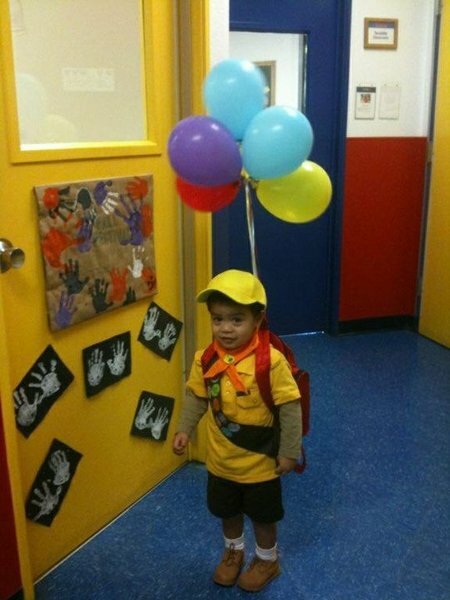 I wonder if their parent dressed like Mr. Fredrickson? 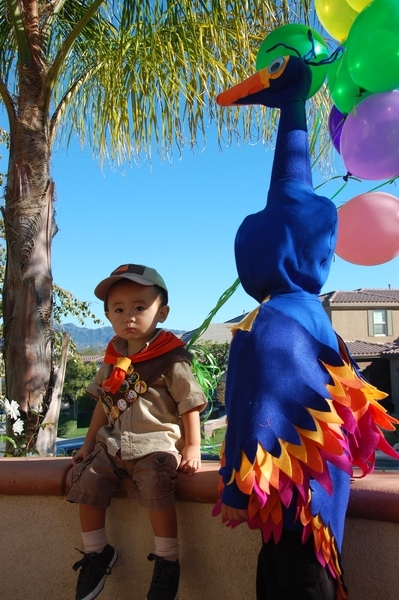 The Russell costume looks a combination of on hand (possibly thrifted), with a handmade sash with badges on it, and handmade handkerchief and modified hat, oh, and balloons, of course. The Kevin the Bird costume appears to be a modified royal blue hoodie (a slit cut in the hood, a felt-covered cone for the neck, not sure on the head), and felt feathers. Here’s another take on the Russell costume. Such a cute boy! 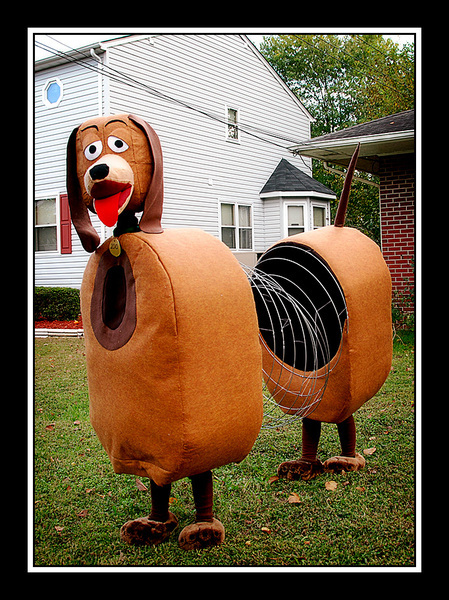 The owner of the costume said: My mom made this Slinky Dog costume for my boys, age 6. 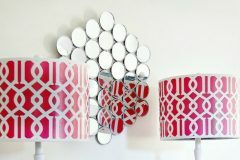 She spent a month on it but it turned out great! I can identify a few parts of the costume: looks like felt yardage was used for most of the body, brown leggings (or tights) with fuzzy brown slippers (or faux fur-covered slippers). Looks like the slinky is really some wire (probably straight off of one of those giant spools). I wonder how comfortable this was to wear? Probably doesn’t matter, because it’s good enough to go straight to Disneyland and start signing autographs. 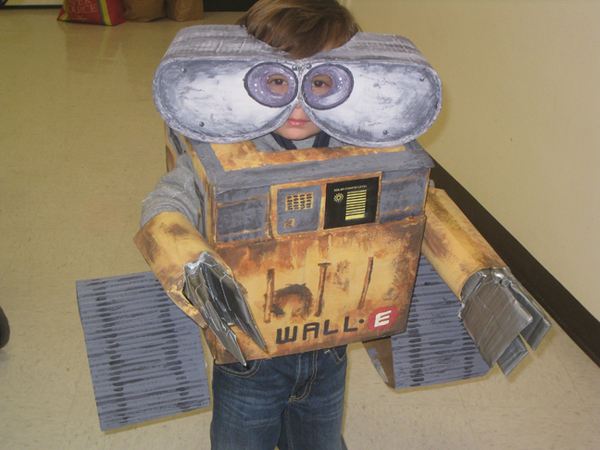 My three year old son wanted to be Wall-E for Halloween so I decided that I could make it. I started with a cardboard box and made cutouts for the head and arms. For the wheels, I pulled apart one side of the another piece of cardboard to use the corrugated part as the texture of the wheels, then shaped them and used hot glue to attached the sides together. For the arms I used Pringles chips tubes covered with brown bags and duct tape for the hands. The eyes were shaped out of cardboard and glued together with hot glue then I taped the eyes to kid’s safety goggles. I used images of Wall-E onine and used those as reference to paint the entire costume in tempera paint. He absolutely loves it! Aaaah! 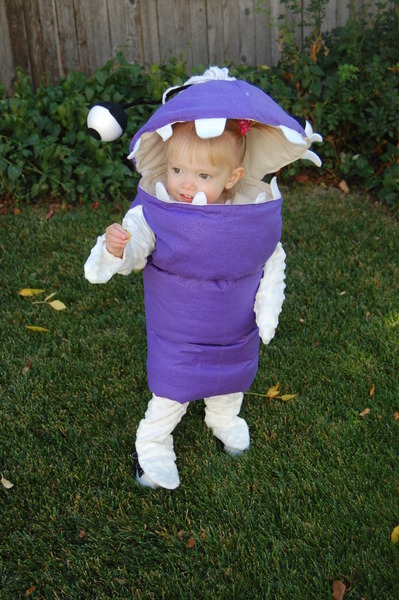 Boo is the cutest part of Monsters, Inc. and this is such an adorable costume. Looks like it was basically a slightly conical padded tube made out of felt or cotton (with teeth added, of course!). The head kind of looks like a completely covered umbrella to me! 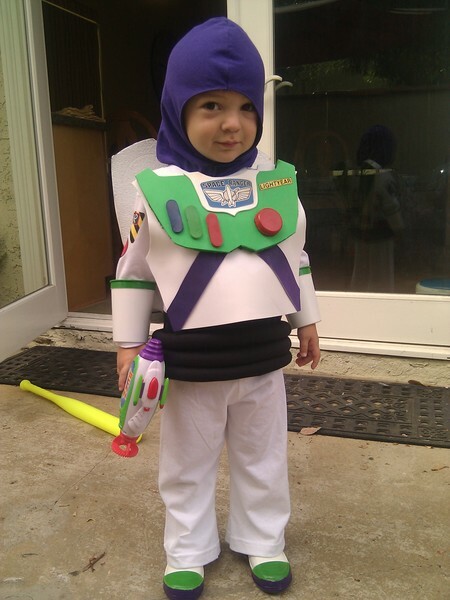 Buzz says: This mini Buzz Lightyear was made entirely from scratch. My Dad made all the armor pieces and my Mom made all the soft parts, logos and iron-ons. It took two weeks to build and my favorite part was being able to wear it to Disneyland. Looks like a combination of readymade items (white pants and shirt), sewn items (hood and rolly belt thing), craft foam (armor and arm gauntlets) and recycled stuff embellishments (plastic cap knob, etc.). Oh, and dig the modded shoes! Looks like duct tape on the shoes? Heather, what an incredible collection of amazingly creative costumes! Gotta say, that very first one with Russell and Kevin completely won my heart! Incredibly adorable! I love Pixar and I love it when people use their imaginations and make their own homemade costumes. My son asked me to create him a Woody costume ~ and he’s almost 20 years old. I must say, he made an awesome Woody! These are the cutest kid costumes I have ever seen! 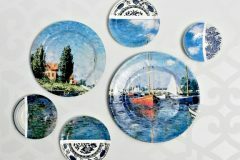 Those are so great! 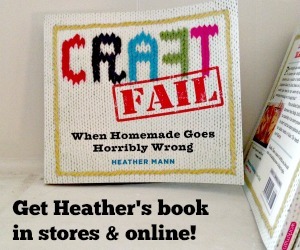 The first one with Russel and Kevin is just awesome, and the others are not short on crafting skill either.